The Hartland Cattle Club wins the 4-H Dairy Herdsmanship Award! From the Vermont Standard: Ten 4-Hers, accompanied by Kerry Gawalt, their leader, as well as their parents took 16 cows to show in the Cornish Fair. The Hartland Cattle Club won the 4-H Dairy Herdsmanship Award!!! This is given to a group for working well together, being good ambassadors to the public by teaching them about cows and farming, and for keeping their barn and animals clean and presentable. Back row, from left, Alex Gray, Gawalt, Emily Surrell, Mary Scherer and Stephen Scherer. Front row, Maeve Leslie-Gawalt, Delia Morgan, Silvia Hale, John Scherer and Kate Wehmeyer. Not pictured, Cody Comstock. It's been a full and busy summer at Cobb Hill. All the things that signify summer on a Vermont Farm have happened in due course: swimming in the pond, making hay, watching the wildflowers progress from bloodroot all the way through to goldenrod. There have been pot-lucks and community meals, birthday parties (including an elegant mermaid cake), 4th of July fireworks, blueberries, raspberries, and corn on the cob. There have been some farewell parties and U-haul loadings as several families have left Cobb Hill. Some after 15 years - imagine all the memories and gratitudes and intertwined relationships! And two young women who have grown up at Cobb Hill have just headed off to start their first years of college - more celebration, and more bittersweet feeling, for sure. And, best of all for me, has been the welcoming of new families into the pattern of life here and the fun of watching parents and kids discover some of the richness of this place - whether it's rip-sticking in the basement of the Common House or having the whole community march up the hill to share your birthday cake on your fifth birthday! Posts on this blog have been a little sparse of late - attributable to summer abundance of course! But school starts next week, and with the wind down of summer you can expect more frequent updates. A video by the YALI Fellows. Around 30 Fellows from the President Obama Young African Leaders Initiative (YALI) came to Cobb Hill for an afternoon and evening of tours, conversations, soccer, a barbecue, s'mores by the campfire and a bit of music. There were close to 80 people in attendance, between Cobb Hill families, YALI Fellows and YALI administrators from Dartmouth. It was fabulous to see our Cobb Hill kids in deep conversation with the Fellows, or watch the impromptu, multi-generational soccer game. YALI Fellows got to taste Cobb Hill cheese and frozen yogurt. It was a blast introducing them to maple syrup and explaining that it is made from the sap of trees. YALI Fellows brought their own treats to share, including grasshoppers! Fellows shared their interests and heard about life a Cobb Hill. There were great conversations about conflict resolution, governance, small-scale farming, green building and energy systems, and our small businesses. After dinner, we sat around the fire pit. The kids taught the YALI Fellows how to roast a marshmallow and make a s'more. People brought out instruments and shared a love of music. An annual spring event at Cobb Hill has become the inoculation of a new batch of hardwood logs with shiitake spores. What could be a long and arduous job – they need to inoculate more than one hundred logs and each log has dozens of inoculation sites – is made more fun by inviting in neighbors from surrounding towns to help and learn about growing mushrooms. In return, each helper leaves the day with two inoculated logs, which they carry home and tend until they produce mushrooms next summer. I went to DC this past weekend to take part in the Democracy Awakening rallies including civil disobedience direct actions. Democracy Arising was a coalition of many, many different organizations – from Sierra Club to the NAACP – all of whom are concerned about getting dark money out of politics, overturning Citizens United, passing a strong immigration bill, reinstating and updating the Voting Rights Act, ending gerrymandering etc. A small group of 100 marchers walked from Philadelphia where the constitution was signed to the Capitol building the week prior to last’s weeks rallies. Each day last week highlighted one of the issues and people marched and then did sit ins on the Capitol steps. The culmination of the week was a big march around the Capitol on Sunday followed by a Monday morning sit-in; I was involved in both of these events. I was arrested, but because I went willingly off the steps, I was not handcuffed or put in jail. 300 of us (Ben and Jerry included) were held on the Capitol lawn while they processed each one of us separately. On Tuesday we had to report to the police station to be fingerprinted and pay a $50 fine. Here I am waiting in line with Ben Cohen. Over the years I have participated in many marches and nonviolent civil disobedience actions. I have never chosen to be arrested. 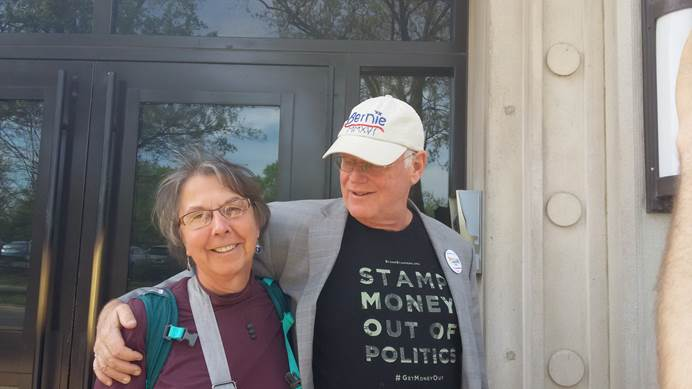 As I turn 65 this year, I have determined that it is my time to step up for Democracy and the planet we all love. I cannot sit quiet and allow all I love to go up in flames. Expect more of this from me.